He grabbed people's attention as soon as he made his acting debut. And he did great. He would then encounter a crisis but everytime, he would somehow find his way back. And he went around the world to look for new work. This is the life of this top star whose life is like a drama or drama turns out to be what his life is. Im appeared in KBS drama "Haetteulnal" where Lee starred as the leading male. Im, who had just arrived in Seoul, stayed with Lee at his house and they have been close ever since. "Haetteulnal" in 1991, followed by "Tomorrow's Love" and "Police", placed Lee onto stardom rapidly. However, while receiving training at the acting agency, he used to be told that he would "be the first one cut" because he would read his lines as if he was reading a book and with bad pronounciation. Despite the criticism, he improved so quickly that those around him were soon telling him he has great pronunciation which helped him win more main character roles. She played the main female role in "Asphalt Man" and "Who Makes Me Crazy" opposite Lee. Lee displayed his great range in acting by maintaining a mellow atmosphere with his role despite the grand scale of "Asphalt Man" which was mostly on location overseas. He is an actor who, as the main character will effectively lead on a story with the grandest plots, yet will also appeal to viewers with the romance between him and his female co-star's character as was seen in dramas "All In" and "IRIS". The director who helmed SBS' "White Nights 3.98". He also directed SBS' "Sandglass" and wanted to give the role of inspector Kang Woo-suk to Lee but felt "he was too young and lacked perspective on the piece" so was dropped from the part. After that, Lee fell into a slump with several failed roles, saying his "identity as an actor became shaken up". That is when Lee called Kim, listening to Lee tell him "everything that should be and should not be said". Lee said he became moved and started listening to Kim's advise from thereafter. Lee's co-star of SBS drama "Happy Together". The two teamed up for "Happy Together" after having become close while filming SBS series "Her Beautiful" where Lee played a boxer and Song his sparring partner. At the time, Lee had said, "When I come to think about it, I'm not handsome so I think I'm better suited for characters who have simple and rustic personalities". Hence he had played Seo Tae-poong, a baseball player who had no skills nor future, in "Happy Together". He then started showing different sides to him by playing a man who stammers in film "The Harmonium in My Memory" and a chef with a split personality in SBS omnibus drama "Love Story". His younger sister and also 1997 Miss Korea. His family had a big influence on his acting. His family was wealthy enough to live in a house with a garden but this in turn proved to be a setback for Lee who had directors tell him his wealthy background is his weakness. Once Lee became a big name, his father passed away after his business went bankrupt, leaving a large debt for Lee to resolve which he did by working nonstop thereafter. That is why some people asked him if he was thinking of quitting being an actor after making money through the numerous commercials he was shooting. And because Lee never showed others how much burden he was under, he said that once he went back to shooting dramas, he felt relieved yet unstable. He said he has never been able to use a public bathroom since making his debut because he rose to stardom immediately. Hence he once said, "I have dealt with much pain and experienced emotions I have never felt before. That is why I don't have an excessive amount of trust in myself". Director of "JSA - Joint Security Area" and the omnibus film "Three, Monster". Lee started receiving so-called "better roles" after the success of "JSA - Joint Security Area". That is why some jokingly say he saw success because the film was great but "Three, Monster" is probably more important for Lee since he played a film director who on the outside is just a regular person but psychotic on the inside. He played a similar character in "Love Story" but in "Three, Monster" was able to portray it in a more extreme form and this was when he slowly started to become known as a movie star. Female actress who starred opposite him in SBS drama "Beautiful Days" and movie "Everybody has Secrets". The transformation Lee showed in his acting from starring in "Happy Together", solidified the character he played in "Beautiful Days". Lee was a 'cool' leader of his team but with ambitions running so high that they would make him seem like the bad guy. He was also a character who had an extent of instability over family issues. There aren't too many characters which have such a variety of facets to them so once again he was able to be acknowledged for his capabilities. He was able to fulfill the role of the male lead in "Beautiful Days" and transform himself into a casanova dating three sisters in "Everybody has Secrets". As a star, Lee's biggest strength is that he has the capability of bringing melodrama into a film. As an actor, Lee is someone who can be the main character of a melodrama and also show the inner thoughts to the human. Co-star of SBS drama "All In". 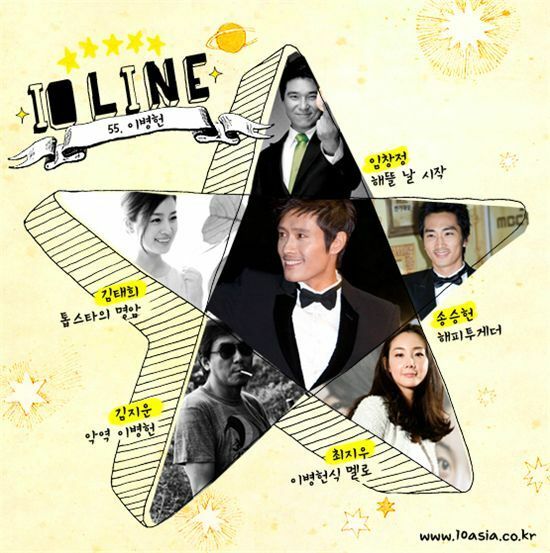 Before "IRIS", "All In" showed the audience what kind of actor Lee was. Lee had said he was interested in seeing the changes a character goes through and he was able to fulfill this by playing the role of Kim In-ha in "All In", an unstable and insecure person who had complicated personal issues. That is why he is good at bringing out a character's personal issues or portraying his emotions even in the most typical plots. However, what became the hot topic during the shooting of "All In" was his personal relationship with actress Song. Their separation brought about various rumors, especially regarding Lee. But like he said, "As much as your fall in love, experience a great love, or crazy love it makes an actor a better person. Just because you're afraid of a scandal and you're afraid you will lose your fans, it's stupid not to fall in love". Director of "A Bittersweet Life" and "The Good, the Bad, the Weird". Kim said, "Lee Byung-hun is an actor who is able to play the role of a person who is on top of the world one day but has nothing the next day. When he acts, he is someone who calculates the start and finish of things" so much that he almost got a car racing certificate to play his role in the movie "Addicted". That is why he can so skillfully express the character who becomes shaken up the moment he is unstable and his role in "A Bittersweet Life" made us identify him as the actor he is today. As the character gets revenge on his boss who betrayed him he asks himself 'why' but doesn't act like a tough guy or a cold-blooded killer. Instead he shows the risky sense of the situation and finishes his job. With the roles that he plays, it shows the diversity that he brings to each character. Of course he can play "the good guy role", "the bad" and "the weird" as well and maybe he can play "the crazy" too. Japanese top star. He starred with Lee Byung-hun in the movie "Hero" and "I Come With the Rain". Lee attempts to make an official debut into Hollywood after "Hero" with Rain and "G.I. Joe: The Rise of Cobra". "G.I. Joe" in particular proved to be a success for Lee, ranking No. 1 on the U.S. box office. His English pronounciation did not become an issue either. He is now set to appear in the sequel to the first film although the reason he believes he was chosen for the role is probably because "he can appeal to the Japanese market and I want to be open to do anything". But it was probably possible because the more famous he becomes, the more freedom he has in choosing the roles he wants to play. He did not hesitate in taking on the role of a villain or playing a supporting role in a Hollywood film. And he did well in revealing his complicated past through his acting in "G.I. Joe". Actor Lee Byung-hun shows that he can change, be shaken and still move on. His co-star from KBS drama "IRIS". Lee's role in "IRIS" has brought him twice as more fame than his role in "All In". The storyline for "IRIS" met a lot of criticism but the emotions he displayed through just his eyes while wearing a mask when he was reunited with actress Kim, made viewers acknowledge Lee as an actor worthy of leading a drama worth 20 billion won. He always exceeds expectations -- whether it be a melodrama or a Hollywood blockbuster. The ending of the show was bittersweet for Lee though, since he became involved in a scandal regarding a former girlfriend. The continuously divulged details of how they met to how they broke up will have had a negative influence on him. And the public may come to a conclusion on his image due to this incident. But one thing is for sure. Whatever has happened in his life has been reflected in his acting and brought him where he is today. This incident may have the same affect too. Because he is a top star, but also an actor who has acted so far in such a way. Hollywood science fiction blockbuster "Avatar" has come from behind to the second place, outpacing local film, "The King and the Clown".